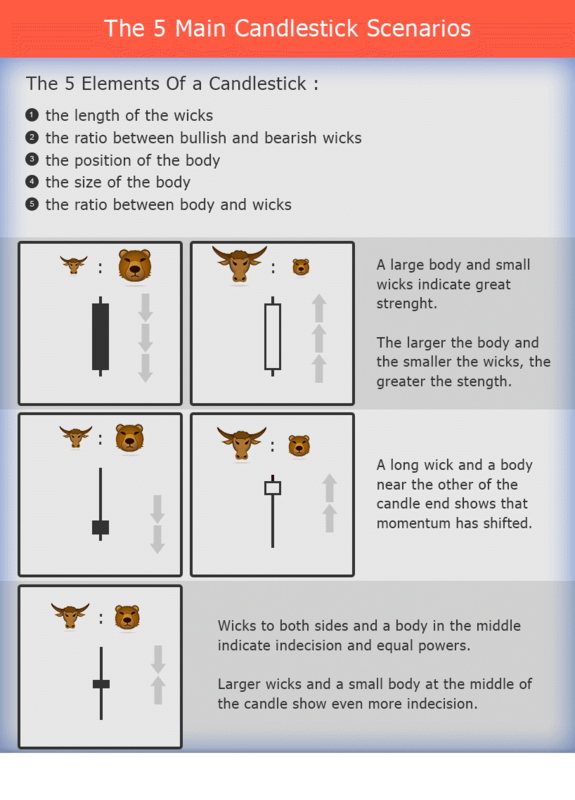 Understanding candle patterns far outweighs just memorizing and recognizing certain formations. Many books on candle patterns were written, involving hundreds of different formations that supposedly provide secret information on what will happen next. The truth is, it will not matter for your commercial effectiveness, whether you know what Concealing Baby Swallow, Three Black Crows or Unique Three River Bottom. Before we start going into actual candles, it's important to be in the right way of thinking. Let's think of price movements as a war between bulls and bears. Each candle is a battle in a total war and the 5 candle elements tell us who's ahead, who pulls back, who controls, and who has a better chance of winning the next battle. Is the current candle bigger or smaller than the previous one? Does the size change meaningfully or not? Does the change happen during an inactive trading period? For example, EUR Forex couples tend to shrink in size during the quieter Asian session. The candle body is a great starting point because we can get a lot of information from it. The body shows how far the price has passed during the candle. The shadow can show the volatility of price movements. When shadows become bigger, it shows an increase in volatility. This often happens after long phases of trends before a turnaround occurs. Or on a high level of support and resistance. Do you see longer shadows or bodies? This is a continuation of the previous point. You see that once we begin to combine the information provided by shadows and bodies, we can practically analyze all Japanese candle formations. Now that we have covered the individual elements, we can unite things and see how we can use our knowledge to distinguish the price charts. 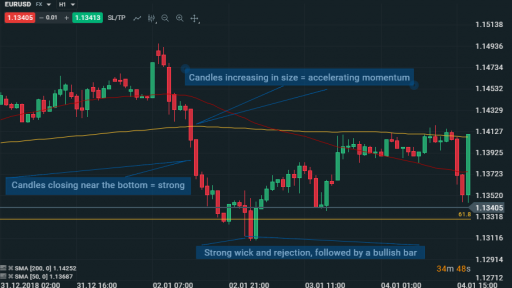 With this article we want to show you that you do not have to remember any candle formation to find out what's going on. Exactly the opposite. 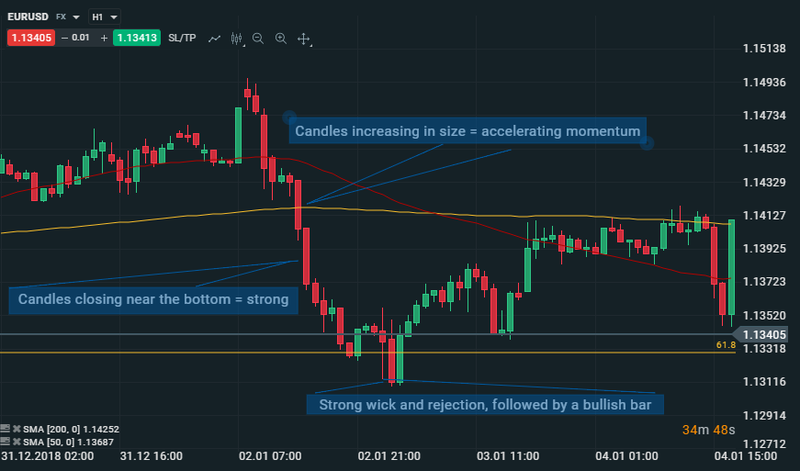 It is very important in your path to become a professional and profitable trader, to start thinking outside the box and to avoid the usual mistakes of the beginners. Learn how to understand how buyers and sellers push the price, who controls and who loses control.